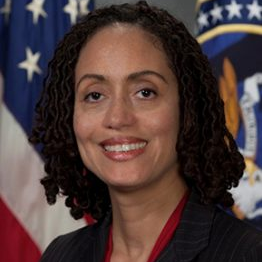 Dr. Stacey Dixon became the Director of the Intelligence Advanced Research Projects Activity (IARPA), within the Office of the Director of National Intelligence, in September 2018. She had served as IARPA’s Deputy Director since January 2016. Dr. Dixon joined IARPA from the National Geospatial-Intelligence Agency (NGA) where she most recently served as Deputy Director of InnoVision and oversaw geospatial intelligence research and development. Prior to InnoVision, she served as NGA’s Chief of Congressional and Intergovernmental Affairs. From 2007 to 2010 she worked on the U.S. House of Representatives Permanent Select Committee on Intelligence (HPSCI) staff. From 2003 to 2007 she worked for the Central Intelligence Agency (CIA) assigned to the National Reconnaissance Office (NRO)’s Advanced Systems and Technology Directorate. Dr. Dixon holds doctorate and master’s degrees in mechanical engineering from the Georgia Institute of Technology, and a bachelor’s degree in mechanical engineering from Stanford University. She was a chemical engineering postdoctoral fellow at the University of Minnesota. Dr. Dixon is a native Washingtonian and currently resides in the District of Columbia. Check out the incredible speaker line-up to see who will be joining Dr. Stacey.